Weather Events 3 and ACC or AGW, Is the impact of AGW on extremes now unambiguous? There are lots of lines of evidence offered for global warming. Chief among these are long term ground level temperature measurements showing a warming world which have now been supported by the reanalysis of satellite measurements of tropospheric temperatures. More recently analysis of the measurements of sea temperatures over time at different depths has added robustness to the evidence. Also important are global atmospheric circulation models and linked ocean circulation models that reliably produce these temperature changes when fed information on the rising levels of green house gases. There are other lines of evidence as well. However, it is fairly obvious that public will not take GW seriously enough to make life style and financial sacrifices until it is clear that GW is impacting their lives directly. Determining whether extreme weather events are related to GW is made difficult by wide variation in natural weather events. For instance, the number of tropical cyclones in a given region, of which hurricanes are a subgroup, tend to change in 30 year cycles but remain stable in number year to year globally. Experts can detect no increase in their frequency. Other extreme weather events like droughts, record high temperatures, record high minimum temperatures, record rain falls, and the like suffer from similar difficulties of analysis. Nevertheless, some scientists are proposing that looking at the trends of these events or, in the case of tropical cyclones, trends in the total energy of individual storms, can separate the GW impact from background weather noise. After that topic was closed I opened a similar in one in September of 2007. Clearly, this July has been significantly hotter than previous years in the record. In fact the average daily high temperature for July 2010 is 3.6 standard deviations above the mean of all recorded July values. For a normally distributed random variable, the chance of being so extreme is only 0.0003 — less than 1 chance in 3000. Which agrees with statements from Russian meteorological officials that such a heat wave hasn’t been experienced in Moscow in at least 1,000 years. Have some extreme events occurred that clearly would not have in the absence of ACC (AGW)? Is it clear that extreme weather events now occur more often? What new scientific papers cause you more or less concern about the build up of greenhouse gases and carbon blacks? higher levels of winter precipitation leading to heavy snowfalls. Yes, I think that we have had such a dramatic increase in these extreme events that we can now say that, as a group, they constitute strong additional evidence in support of the ACC hypothesis. The recent paper on the dramatic decline of phytoplankton is very alarming, because they constitute the foundation of the whole marine food pyramid. Take them away and everything else dies. Whales, sharks, tuna, dolphins, salmon, crabs, lobster, krill, seals, walruses, and yes, polar bears -- all those species will be clobbered by this. And, as much as the denialists rant about the costs of carbon abatement, the costs of such climate changes are even higher. I just read last night that the El Nino of 1998 is estimated to have caused a total of $100 billion in losses worldwide. That's just one event in one year. Add up everything else, and make it stronger, and you're talking trillions and trillions of dollars. I think it would be great to compile a list of extreme weather events in the last ten years to see just how bad it has been. Does anybody know of such a list? You appear to have a lot of company among climate scientists reluctant to say declaratively (without farther analysis) that the Eastern European heat wave could not have happened without ACC. However, this is due to the extra-ordinary care scientist take in making definitive public statements. 3,000 to one odds is good enough for me and certainly dwarfs the level of probability used to promote most political statements, and we are talking about a political conclusion not a scientific one. Yes, I am in complete agreement with the sentiments expressed. When I put on my citizen's hat, I blame the recent heat waves on ACC; but when I put on my scientist's hat, I have to say, we don't have solid evidence yet. In terms of making policy decisions, however, the evidence is surely more than strong enough to support taking strong action. If we can base a decision so serious as one to go to war on the hunches of a few politicians (contradicted by the official investigation), then I think we can easily make a decision to take equally strong action on ACC. The Iraq War has already cost us over a trillion bucks; so using it as a gauge of political reliability, we are long overdue for spending a like amount to curb ACC. And we'll probably get a lot more for our money! My guess is that we won't take action until we get a killer heat wave such as they have experienced in Europe several times. When crops are failing all over the Midwest, forests are burning all over the West, and people are dying from heat exhaustion all over the east, then I think we'll see some action. And something like that could happen anytime now. There are lies, damn lies, and statistics. This is the last one. The previous hottest month in Moscow was in 1938. Was AGW the cause of that? What does Tamino say of the chance of July 1938 happening? Tamino's quote is useless. Yes, he analyzes the chance of such an event happening and yes it is worthless to do so. There is a 1 in 100,000,000 that an individual will hit the lottery and every week it happens to someone. The chance of life starting by chance (or however you want to ascribe it) is put in the 1 in trillion range, and yet is happened. Just because something is unlikely does not mean anything. Snow falling in North Dakota in June for the first time in 60 years? These clearly would not have happened if it was not getting hotter. Extreme which way? I don't think it is clear at all. Yes, extreme weather events occur and we can all now observe them in real time. Does that mean they are occurring more frequently or are we just more aware of them? This research represents the first analyses of snow cover over the Russian territory, using data from more than 800 stations that extends from 1966 to 2007. Using our methodology, we revealed previously unknown regional features in the change of snow cover characteristics. Kitaev et al (2004) reported that nearly the entire territory of Northern Eurasia, except the Arctic coast, experienced an increase in snow cover duration from 1966 to 1990 and on the Arctic coast a decrease had been noted. In comparison, from 1966 to 2007, the present research demonstrates a tendency towards a decrease in snow cover duration, which is influenced by more recent changes in weather patterns and climate. In addition to decreases in the duration of the snow cover season found earlier on the Arctic coast, current research also reveals substantial decreases in southern Siberia and on the Kamchatka Peninsula. While over most of the country, SCD decreases, regional SCD increases are found in central Siberia and on the coast of the Sea of Okhotsk. As compared with the data from the 1966–1990 period (Krenke et al 2001), linear trend coefficients of maximum snow storage have increased from 2 cm/10 yr to 6–8 cm/10 yr, with the maximum rates of change observed in Western Siberia. However, a tendency towards a substantial decrease in maximum winter snow storage is found in southern Siberia (–12 cm/10 yr), accompanied by a reduction in snow cover duration. In essence, the snow cover period tends to be shorter; the first snowfall occurs later and/or spring snowmelt is earlier over most of Russia. However the amount of snow that falls during the cold season has generally increased, particularly in the western portion of Russia. There are some trends, but this paper doesn't speculate on causes. Amlord, I think you're laboring under some misconceptions regarding the science here. Let me help clarify it. First, on the matter of probability, you seem to think that probability theory is a nest of lies. I agree that it is easy to misuse statistical methods to produce bogus results. There's an old but still excellent book on this called "How to Lie with Statistics" that explains how statistics can be abused. This does not mean, however, that statistical methods themselves are unreliable; when carried out in a rigorous manner, statistical results are extremely reliable. Indeed we all each and every day literally bet our lives on statistical results in the decisions we make and the technologies we use. What Mr. Tamino has calculated is the standard deviation of the monthly average of temperatures in Moscow in July. He compares the mean monthly temperature for July 2010 with the mean monthly temperatures for all Julys in Moscow from about 1950 onward. His finding is indeed significant. You cite 1938 as providing the previous hottest month in Moscow, but this assertion is contradicted by the data provided by Mr. Tamino, who reports a mean monthly temperature for July 1938 of 72.5ºF. Could you provide the source for your data so that we can resolve this contradiction? Mr. Tamino's results are not useless. They are interesting, but they do not in themselves prove ACC. They constitute one tiny datum that supports ACC. The significance of that datum, I think, is that it has public import. The general public won't understand the enormous significance of falling phytoplankton densities or rising deep ocean temperatures, but it does understand heat waves and forest fires. Thus, these extreme weather events will be useful in getting through to the public the gravity of the situation. There is a 1 in 100,000,000 that an individual will hit the lottery and every week it happens to someone. If there are 100,000,000 tickets sold, the overall probability is certainly very high. If only one ticket is sold, and that ticket wins the lottery, then you truly have something quite remarkable. 1. ACC is not the same thing as AGW. Climate change means "a change in climate". That includes some places getting colder. The earth's weather system is enormously complex and it is entirely possible for a few places to experience colder temperatures while the earth as a whole is warming. That's because weather patterns change. The weather patterns that have governed Baghdad's weather for millennia are now in flux and it is entirely possible that a band of frigid air from Siberia could get shunted southward to collide with moist air from the south, producing snow. Even more likely is the possibility of frigid air from the Iranian plateau just east of Baghdad moving westward under the influence of a reversed weather pattern. We're seeing lots of climate changes in many places in the world -- why shouldn't some of those changes involve local cooling? 2. More important, an increase in snow is usually in indication of warming, not cooling. Really cold air cannot hold much water vapor, so you don't get much snow coming from extremely cold air. The warmer a body of air is, the more water vapor it can hold. Thus, you can expect the greatest snow from an air mass just below freezing. Temperatures in Siberia in the winter are usually far below freezing; if ACC has warmed Siberia (as the evidence shows), then we'd expect more snow, not less. It is all about how you present you findings. Yes, I fully believe that Tamino can reliably state that the July 2010 temperatures are 3.6 standard deviations above the norm. What I am concerned about is his conclusion that this means that the warming is caused by man. It was hot in Roshydromet. No doubt about it. It was way higher than the previous hottest month which didn't happen last year or the year before or even in storied 1998. It happened 72 years ago. Tamino does not tell us why this year the temperature deviation jumped by so much. He makes no attempt to explain why this particular July shattered records. Was the slow heat up of the planet responsible? If so, why was this past winter so cold? Why did the temperature jump by so much this year? This year's temperature is clearly an anomaly. Clearly. an. anomaly. Clearly. Look at the graph. It isn't a steady upward trend which would be in line with a slowly heating planet storing up energy that it cannot release past a greenhouse gas cloud of CO2. In fact, the last eight years show a dramatic downward trend. Why did it jump this year? Why? And that means that the suggestion that this heat wave is just a natural variation, not due to global warming, is implausible. Or as we say here in Maine, t’aint likely. This is garbage "science". A one in a thousand event is exactly what a fluke of natural variation is. A steady upward trend would indicate something different. What in Tamino's post says anything about ACC or AGW or whatever the acronym of the week is? He made an observation about a temperature anomaly in Moscow and said it was a one in a thousand event. He made no observation about the previous temperature trend which was downward. His results are useless. Explain to me how a greenhouse effect causes cooling? The entire concept is that less energy is radiated out into space. That energy is trapped in the Earth's atmosphere and hydrosphere. How could that possibly cause anything to be cooler. Explain the heat transfer mechanism involved. Yes, cold air cannot hold as much moisture as hot air. A warmer atmosphere would hold more moisture, causing less precipitation. The release of precipitation is caused by different temperature air masses coming together. I don't see how a warmer planet would cause more precipitation. It may create different wind patterns which could change things up. However, I haven't seen a study showing some shift in wind patterns, have you? Amlord, I agree with most of your argument that Mr. Tamino's observation has little evidentiary value in supporting ACC. As I said, its value lies in communicating the seriousness of the problem to the public. Scientific papers fly right past most people, but dramatic news stories have a big effect. I would prefer that decision-making be done on a purely rational basis, but then, the average voter isn't particularly rational. Yes, the source you provide contradicts the data Mr. Tamino provided. I don't think we need to argue over which value is correct; it really doesn't matter much one way or the other. Weather is not climate. The Earth is not a single reservoir of heat; it is a complex system in which heat moves around in very complicated ways. The temperature at one point need not be the same as the temperature at another point. There are broad differences in temperature all over the globe. ACC doesn't say that, every day, in every location, in every way, the temperature will slowly climb upwards. Sometimes the temperature will go down. What ACC does say is that globally averaged climate will show, over the course of decades, an upwards trend. There's nothing in this statement contradicted by an extremely cold spell somewhere on the planet; the important issue is the planet as a whole, averaged over long time spans. The specifics of heat transfer are complicated, but at the simplest level, the general flow of heat is from the equators to the poles. In the tropics, warm air rises and then moves towards the poles at high altitudes. Cooler air from higher latitudes moves in to take its place. In the horse latitudes, the warm air descends and then begins its return journey as cooler air. In the process, it releases its heat to another cell called a Ferrel cell, which does the same thing in reverse for latitudes from 30º to 60º. The final leg is handled by a single polar cell which circulates air from the end of the Ferrel cell to the pole. Taken together, these three cells move heat from the equator to the poles. The process is complicated by the Coriolis effect, which causes air to veer sideways as it moves, causing big swirls. These massive air motions in turn drive weather. The descending motion of the Ferrel cell powers the jet stream, which drifts north or south depending on the amount of heat in motion. High pressure and low pressure areas are generated at curves in the jet stream. These cause low-altitude air to move towards or away from them, but due to the Coriolis effect, the air swirls around as it moves inward or outward. The various low-pressure and high-pressure areas interact with each other in very complex ways. However, there are general trends to them: they mover further north over oceans and further south over land (guided by the jet stream). The storm path in the northern hemisphere runs from west to east, so that your weather comes from the west -- but that can change depending on the twists and turns of the jet stream. Moreover, low-pressure and high-pressure systems grow and weaken as they move, depending on local conditions. Low-pressure systems generate lots of storms (I won't explain why -- too complicated), and high pressure systems bring cold, clear skies. However, they also pump air around. Depending on where you are relative to a low or high pressure system, you can have warm air pumped towards you from the south, or cold air pumped toward you from the north. That provides us with the first possible explanation of snow in Baghdad in June. If a suitable high pressure system parked itself in Central Asia for a while, it would pump cold Arctic air southwards. If, at the same time, a low-pressure system were pumping warm moist air northwards from the Indian Ocean, then there would be a collision between the cold northern air and the warm southern air -- and such collisions always generate lots of wild weather. Another possibility is a low-pressure system over the Iranian plateau getting shoved westwards by several other systems to its east, which is rare but not impossible. It all depends upon the configuration of the heat flow. When temperatures are stable, weather settles into a fairly regular pattern, but when you start monkeying around with temperatures, creating changes in the system, you can get some pretty wild excursions from normality. Yes, cold air cannot hold as much moisture as hot air. A warmer atmosphere would hold more moisture, causing less precipitation. The release of precipitation is caused by different temperature air masses coming together. I don't see how a warmer planet would cause more precipitation. It may create different wind patterns which could change things up. Warm air soaks up more water vapor when it moves over the oceans. However, that air mass is moving, and as it moves over land, it eventually encounters mountains. Air can't go through mountains, so it has to go over them. This forced upward motion results in a reduction of air pressure, and air at lower pressures can't hold as much water, so the water condenses into rain and falls. All sorts of factors can cause air to get pushed upwards and thus dump some of its water load. A weather front can wedge underneath a mass of warm air, pushing it upward and causing precipitation. Think of it this way: you are an egg-carrier, and you can carry a lot of eggs when you're walking across a perfectly smooth, level surface. But if you encounter some rough ground, you're going to start dropping some of your eggs, and the rougher the ground, the more the eggs you will drop. All sorts of other things can cause you to drop eggs: somebody bumping into, a change in direction, even a distraction. Yes, warm air can hold more water vapor -- but it can lose it in the form of precipitation very easily. That's why, in general, warmer climes are also wetter than cooler climes. I haven't seen a study showing some shift in wind patterns, have you? There's gobs of evidence regarding changing ocean currents, which in turn act as a major driver for weather. There's no question that the primary ocean circulation is changing, although we still don't have a solid grasp of the nature of this change. There are opposing forces at work: reductions in the north-south thermal gradient due to greater warming in polar regions act to weaken oceanic circulation; decreases in salinity due to increased water melt in northern latitudes acts in the different direction. We don't quite know yet exactly what's going on, but we do know that something's afoot. And when it happens, it could well be very destructive; I'm just finishing up a book on this and will report back later. How can you burn yourself on a stove when the surrounding temperature is below freezing? Air currents are discrete while also interactive with other air currents. For instance in one area warm air can move say south to north creating a vacuum pulling cold air north to south in another area. There are all sorts of forces including the spinning earth that causes warm and cold air currents to be pulled every which way. Global warming simply means over the longer term there will be more and more record highs at certain points on earth's geography and less and less record lows at other points. But there will be some record lows. On the other hand I could not presume record temperatures in Moscow this July of themselves prove much of anything about global warming. As one can see if you start from last year and read backwards in time there is no obvious trend for Moscow temperature in July. Thank you for acknowledging that "we don't know" how ocean currents work. There is no known correlation with AGW. Sinking was undoubtedly enhanced last winter by air temperatures over the North Atlantic that were 9° to 11°F (5° to 6°C) colder than in the previous seven years. That often occurs when a seesawing pattern of high- and low-pressure air masses, called the North Atlantic Oscillation, is in its “positive” position, bringing frigid westerly winds from Canada streaking across the North Atlantic. But, curiously, that was also the case in 2006-2007, in which sinking did not occur. The lack of substantial sinking throughout the decade meant that there was no “preconditioning”—that is, colder waters could not build up from previous winters to a point where they are easily pushed over a density threshold and sink the following year, the research team said. That made the sudden reappearance of sinking in 2007-2008 all the more surprising. "Surprising" and science are a tough mix when you are coming up with a theory. We don't know how the climate nor the ocean current works. This year there have been a lot of new high temperatures. Any studies been done on this theory of yours? Well this is an unusually hot year so of course a lot of new records are going to be set and probably not too many cold ones, but no doubt a few. More generally what theory of mine? Air currents are a theory? If you have a problem with my description-explanation please specify. Whoa! To acknowledge the limitations of our knowledge is not a declaration of utter ignorance. We know a great deal about the ocean heat transfer system. The limitation I described is that we do not yet have a good handle on the changes that are taking place as we speak. And the concept of "correlation" doesn't apply when we talk about ocean currents and ACC. We know that ocean currents are extremely important to the transfer of heat on the earth's surface. We know that these currents in turn have a pronounced effect on weather. So if we change the total heat content of the oceans and reduce the temperature gradient between the poles and the tropics, we can be very certain that the ocean currents will also change, possibly dramatically. We don't know how the climate nor the ocean current works. Again, you assume that anything less that perfect knowledge is utter ignorance. This isn't black and white; it's gray. We do know a great deal about both climate and ocean thermal transfer, and in fact, what we do know about climate provides compelling evidence that anthropogenic releases of CO2 are increasing temperatures. However, I really don't want to get into the ideology-versus-science debate in this topic. TedN5 set it up specifically so that we could have a discussion of "current events and ACC" (as it were). I strongly suggest that, if you want to debate ACC, we do so in the older and much larger thread. I was speaking of your theory that if the temperature is higher than more record highs will be set than record lows. You stated it as: "Global warming simply means over the longer term there will be more and more record highs at certain points on earth's geography and less and less record lows at other points. But there will be some record lows." I was asking if you had any studies to back up this assertion. I agree with you that this one month of July means nothing. It is an outlier. Unfortunately, Tamino doesn't agree. This casts doubt on his ability to reasonably interpret events using statistics. 1995 broke the record for warmth. Then 1997 became the second-warmest. The next year, 1998, broke the 1995 record. In the US, 1999 came in as the second-warmest year on record, and the fifth globally until it was supplanted in that spot by the year 2000. The very next year then replaced 1997 as the second-warmest year on record, until it was knocked down a notch in 2002, and knocked from the third spot by 2003. Then 2004 came along and knocked 2001 out of the fourth spot. I remember checking the temperature records for my area and discovering that high temperature records were being broken on a regular basis all through the last five years. Yes I would think that too. I regularly check for record temperatures (fairly regularly). August is the hottest month of the year in Cleveland Ohio. Want to guess when the last time a record monthly temperature was set in August this area? Daily temps in August for 44126: the year was 2005. How about the last record cold temperature in August? 1998. Two record colds were set in 1997. Most of the record hots were set in the 40s and 50s. Two were set in the 2000s. No record colds in the 2000s although three record colds were from the late 1990s. If we look at the last 15 years, we have two record hots and three record colds. What about July? 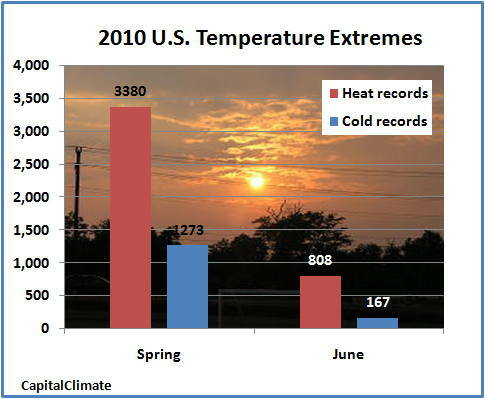 One record hot and one record cold in the 2000s. June? Two record highs one record low since 2000. That is why I'm asking if a study was done. The theory doesn't seem to pan out in my area. I don't have any link right now but it just seems common sense and I have read it from authoritative sources. If the average temperature for the earth for the year is up it seems obvious that there would be more individual records on the upside than the downside. Of course I was strictly talking about Moscow and I was saying it meant little as a stand alone fact. If the July high for the planet connects up with other monthly highs that would then begin to suggest a pattern of increased warming due to CO2 rise is re-emerging, perhaps toward a new temperature record average for the next decade, emulating the progressive rise of the previous 4 decades. It's hard to deny whether you look at a 650,000 year ice sample graph or our measurements over the last 130 years that there isn't a rough correlation between temperature rise and CO2 rise. I just finished reading "The Winds of Change: Climate, Weather, and the Destruction of Civilizations", by Eugene Linden. It's an enjoyable read, and it is certainly wide-ranging. He talks about the destruction of a number of civilizations: the Akkadian empire, the Maya, the Anasazi, the Mississippian culture, all due to sudden but long droughts. The Anasazi case was particularly striking: they experienced very strong rains at the same time that the Mayan civilization was collapsing due to drought. Their population boomed, and then drought struck and destroyed them, too. The central theme of the book is "Abrupt Climate Change": sudden dramatic changes in regional climate. We know that global climate as a whole changes slowly, but that doesn't prevent rapid regional changes in climate. Mr. Linden reports on research on abrupt climate change throughout the Holocene, showing that this is in fact a fairly common occurrence. But what causes abrupt climate change? We don't really know, but the prime suspect is ocean circulation. The circulation of the oceans has now been well mapped and we have a solid grip on the basic pattern. What we're still learning is the mechanism by which that circulation changes. There are two primary forces at work: changes in the temperature gradient between the tropics and the poles (which are being reduced by ACC), and changes in the salinity of seawater at various locations. Salty water is denser and so sinks faster than fresher water. The big question mark here is the likely effect of the reductions in salinity in the North Atlantic due to the increased melt of Greenland ice. This will surely affect the Gulf Stream, but the speed and magnitude of the change is as yet unpredictable. Here's the really scary thing about abrupt climate change: it's abrupt. We cannot rule out the possibility of the ocean currents suddenly shifting course and radically changing the climates of neighboring regions. The top worry is Europe, which bathes in the warmth provided by the Gulf Stream. Should the Gulf Stream alter course or even shut down, Europe will likely revert to temperatures more appropriate to its latitude. London is further north than Winnipeg, Canada; Oslo, Stockholm, Helsinki, and St. Petersburg are all at the same latitude as Anchorage, Alaska. Rome is at the same latitude as Boston. Without the Gulf Stream, these places will revert to temperatures more like their North American counterparts. Thus, ACC could well produce overall reductions in temperatures in Europe even as the rest of the planet experiences warmer temperatures. The West Coast of the USA could also be in for some serious changes if the cold current that currently cools that coast shifts. We might see the deserts of Southern California migrating northward. And all of these changes could happen in a decade! That's the scary part. Right now we really don't know what the odds are of any of this happening -- but neither can we rule out the possibility. Obviously, more research is necessary. But such scenarios are plausible enough to provide an excellent reason to reduce CO2 emissions now. This article and the included charts support Dingo's claim that record high temperatures far outpace record lows this year and in the previous decade, at least for the US. The situation is probably worse for the world in general but I can't find a compilation. HERE is an article indicating a similar pattern in Australia. Other extremes need to be considered as well. For instance the US has experienced several regional precipitation events this year that are considered once in 500 year events - in New England, Atlanta. Oklahoma, Arkansas, and areas surrounding the deluge in Central Tennessee. That event itself was a once in 1000 year deluge. HERE is what the World Meteorological Organization says about current extreme weather events around the world. Thanks TedN5. This graph would be an answer to Amlord's query about the direct relation between global warming and the relative number of individual points of record highs and record lows. And yet as we were cold last year in many of the places we are hot this year (like here in MA) there was no mention of global cooling. Using records set in any one year as proof a long term trend is not scientific. Clearly on the east coast the jet stream is not dipping as it did last year and pushing cold air down along the east coast. Whereas in southern California the opposite is true. They are having a cool summer…. Temperatures are expected to stay fairly cool Saturday, with highs around 70 on the coast and in the 80s inland. Conditions will be a bit warmer on Sunday, according to the weather service. July has turned out to be cooler than normal. Instead of daytime highs approaching the mid-80s, downtown L.A. has experienced temperatures in the mid- to high 70s. From June 1 to July 5, daytime and nighttime temperatures have averaged a relatively cool 69.8 degrees.